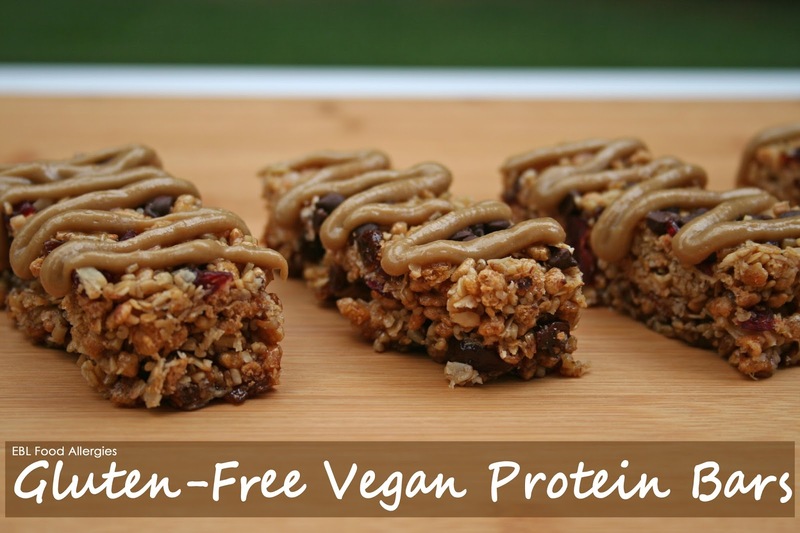 Looking for a gluten free protein bar recipe that is also safe for those with allergies? Try this delicious chewy recipe that is dairy free, soy free, egg free, nut free, wheat free, dye free, corn free, and gluten free. It’s a guilt-free snack to enjoy at breakfast, lunch, or even dessert and it packs easily into a lunchbox. Now that my son is in school, packing healthy snacks and lunches are a priority. I try to sneak protein into his diet as much as possible, which is why I came up with this recipe. 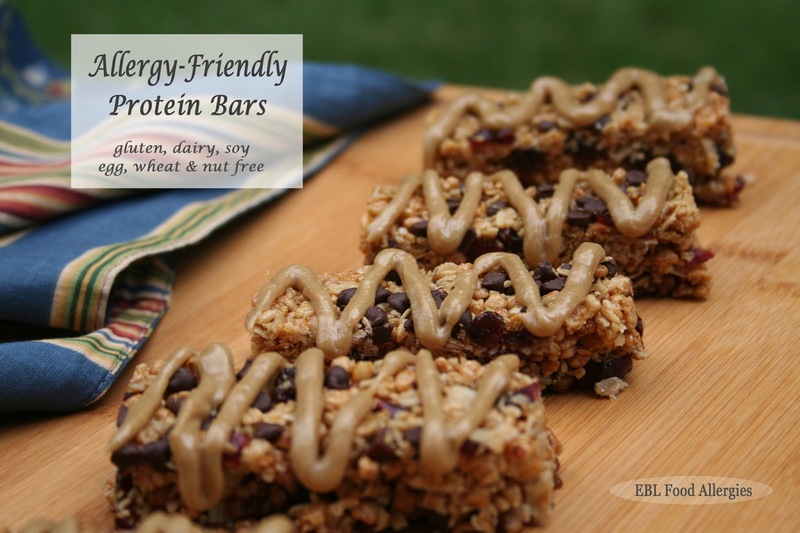 These Chewy Allergy-Friendly Protein bars are easy to make and safe for many who suffer from food allergies. Some of the new ingredients I chose to use are Erewhon’s Gluten Free Brown Rice Cereal, Enjoy Life Foods Crunchy Flax with Chia Cereal, and SunButter Sunflower Spread. I’d like to add that I do have a partnership with SunButter to create delicious recipes and posts however I do NOT have any paid partnership (yet, hint hint hint) with Erewhon (Attunefoods) or Enjoy Life Foods. I share the brands with you all because I believe in them, not to gain a buck (although making money from brands who I trust for all the time and effort that I put into this blog would be suuuuupppper awesome!). Now for the good stuff..the recipe! In a large bowl mix oats, crunchy flax, oil and salt. Pour mixture onto two foil covered sheet pans and bake at 350 for 20 minutes, stirring twice. Remove from heat, put aside and lower oven temp to 325. In a medium size saucepan add brown sugar, honey, apple juice, and molasses over medium heat until bubbles start to form. Remove from heat and stir in vanilla. In the same large mixing bowl used for oats stir together oat mixture, molasses mixture and the remaining ingredients (except the chocolate and icing ingredients) until well blended. Pour mixture into a large parchment paper lined cookie sheet. Using a piece of waxed paper press the mixture into the pan firmly and evenly. Bake for 15-20 minutes. Once cooled enough to handle, sprinkle the chocolate chips evenly onto the top of the protein bars and using another piece of parchment paper, press chocolate into the warm bars. Allow to cool completely before attempting to remove from the pan. Slice into individual size servings. Using a hand mixer combine the SunButter icing ingredients until thick and creamy. Add more powdered sugar to achieve a thicker mixture. Pour contents into a plastic bag. Snip a SMALL corner off the bag and pipe the icing onto the top of each bar. Store bars in an air-tight container to keep them fresh…oh! and ENJOY! These are such a great school snack! These look amazing! I love all the textures in there. These look so yummy and easy to make. I really like the Erewhon rice ceral, actually all of your allergy friendly ingredients! These look amazing! What would you use as a substitute for the crunchy flax (as my son is allergic to flax). Thanks! You can use 6 cups of GF oats instead of 3 that the recipe calls for. I hope this helps and that your sons enjoys them. Thanks for commenting. Is there anything to substitute the brown rice cereal? Or omit it? My son is allergic to nuts AND rice. Hi Crystal, You can do a couple of different things. You can increase the amount of oats and flax to 4 cups each and add more seeds and dried fruit OR you can try substituting another safe cereal option that you know he likes. Maybe kix? if they’re safe.